You just got the biggest bite you have ever felt on your line. The last thing you want is for that line to snap in half. But it’s happened to all of us at least a dozen times, and we know that not all fishing lines are created equal. The line is arguably the most important piece of equipment in your fishing arsenal. The right line has strength and can outmaneuver even the smartest of fish. There are many different styles to choose from depending on what type of fish you are hunting. 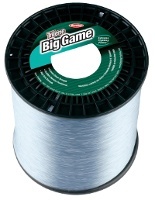 We’ll focus on the three most popular types of fishing line: Braided, Monofilament, and Fluorocarbon. Each type is powerful, but offers different advantages depending on what you are fishing. Read our reviews before you throw that cheap line back in your tackle box. Quality might cost a little more. 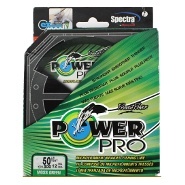 Pictured below is the Power Pro Microfilament line. It’s smooth and thin, which really eliminates the problem of dragging on your line and fingers. But don’t let its size fool you- it’s going to take a real sea monster to break this line. The ultra-strong braided synthetic fiber is highly durable. Whether you are looking for carp, catfish, trout or bass, this brand is the perfect choice. The colors are also bright. This makes it much easier to follow your line (or untangle it) once that fish’s mouth takes hold and drags you across the water. 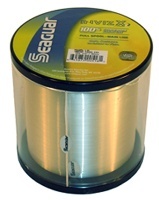 The spool is available in lengths from 150 to 3000 yards and is available in multiple diameters. We aren’t calling it magic. We’ll let you make that call, but next time you’re packing your tackle box, make sure to put a spool of this line in there. You won’t ever go back to the cheap stuff again. If it’s big game you are fishing, then you should go with Berkeley’s Trilene Big Game. It works with any wide range of fishing rods. With incredible knot strength, any resistance from the fish will prove futile to the power of your line. It also boasts shock resistant power and the ability to stretch for when you fight that really big fish. The Monofilament line is great for rock fishing. In a fight, that hooked fish can drag your line through the rocks and it still won’t break against those rough surfaces. At a very competitive price, this is truly one of the best lines for sale. If it’s fly fishing adventures you seek, you are probably going to use a fluorocarbon line for its polymer properties. Even so, more traditional anglers are turning to fluorocarbons because its properties don’t absorb water, which keeps the line strong, and most importantly, it doesn’t carry the stench from the water. The Seaguar Invizx 100% Fluorocarbon Line is incredibly helpful in areas where the fish are slow to bite. This is by far the best fishing line for spinning reels. It’s incredibly agile and handles very well, whereas many other fluorocarbons sink or get in the way of the action. Best of all, it goes nearly unseen by the fish under the water due to its clear color. When you are ready to step up to a larger game, use this line. This brand is more expensive. However, the cost is greatly reduced if you buy in bulk. Ordering in bulk is recommended if you know this is the right brand for you. Next time you are in the market for new line, consider the game or species you want to hunt. Consider the size of the game and the water conditions and type. Each of these brands offer incredible strength and agility. Buy any one of these lines and you are sure to hook more fish. Go ahead and give up the cheap stuff. You’ll thank us later.